Ever have a bad hair day? Well, I've been having a few days like that and unable to post. 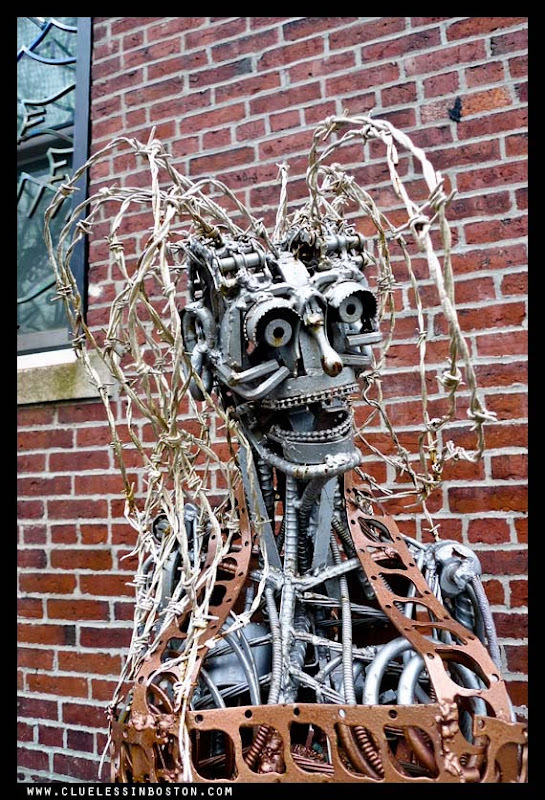 This fine lady was discovered on a visit to Jamaica Plain last year and discovered at Stonybrook Fine Arts. Makes you wonder what the artist was thinking when they created this. Peculiar. Welcome back! Are you kidding? My hair looks like that every day. But she has beautiful eyes. Taking Goth to the extreme. I'd say both the art and the artist had a very bad day! Is that a chainsaw chain used for the teeth? A clever way to recycle, I suppose. Now that is a seriously bad hair day. That's made me feel better. Even on a bad day I'm not that bad! Hope you soon get back to having happy days. I feel like that sometimes, lol. Glad you're back. I'll remember this sculpture when I think I'm having a bad hair day!